I’m not a huge fan of wings, but one type I thoroughly enjoy are the ones sold at Korean markets. Slightly sweet, slightly tangy, and slightly spicy with extra crispy skin, I can gobble these wings right up (no pun intended). 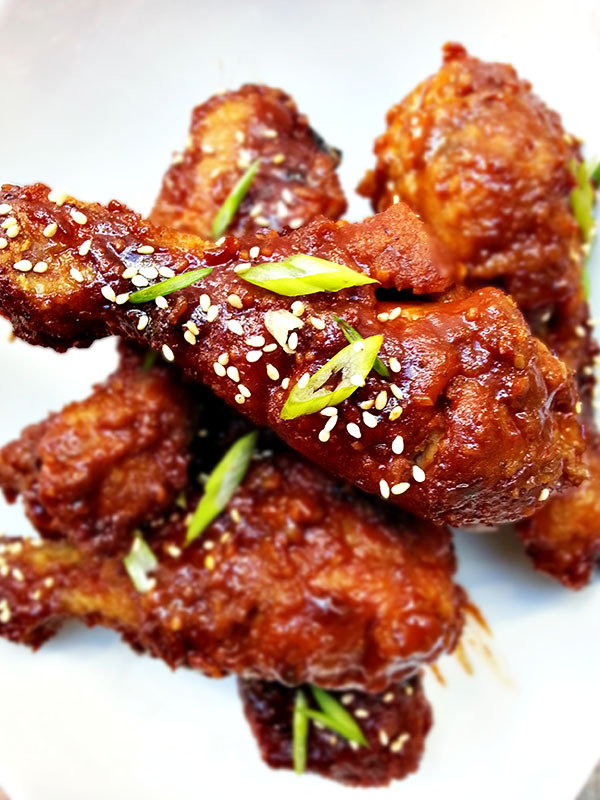 There are many, many Korean spicy wing recipes out there, but this particular recipe is the one that I’ve had success with more than once. Preheat frying oil to 325 degrees F.
Combine salt, pepper, cornstarch, flour and baking soda in a medium bowl. Season chicken with flour mixture, making sure to thoroughly coat all sides. Let sit for 10 minutes. Fry chicken drumsticks until light brown in color about 10 minutes. Remove from heat and drain on paper towels. Return chicken to the fryer and fry once more for another 10 minutes or until crispy and golden brown. Meanwhile, prepare the sauce. Heat the sesame oil in a medium sauce pan over medium-low heat. Add the garlic and saute until aromatic, about 30 seconds. Add the remaining ingredients (rice syrup - rice vinegar) and bring to a simmer, stirring frequently. Remove from heat. Toss the chicken in the sauce and sprinkle sesame seeds on top. Serve immediately. 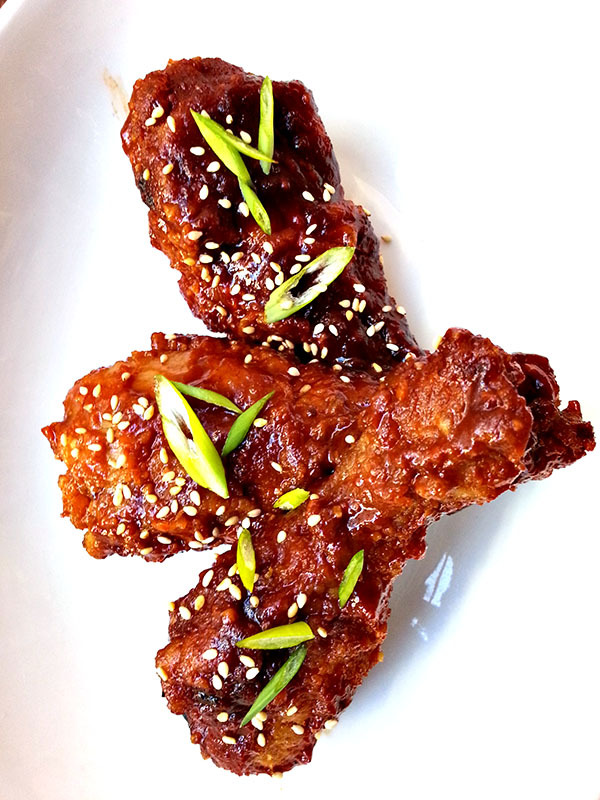 This Korean fried chicken recipe can be used for wings or for drumsticks. Either way, the method is the same. Start by making the dry flour mixture. You can also substitute the cornstarch for potato starch. Because of the size of these wings, they took at least 5 minutes to fry for the first time. Given the amount I had to prepare today (about 30 pounds today), I only fried the wings once. Once it was closer to service time, I reheated the wings in the oven for about 15 minutes at 350 degrees F.
The second time I prepared this recipe, I used chicken drumsticks instead. For drumsticks, I had to fry the chicken at a lower temperature of 325 degrees F, to prevent them from browning too quickly. The sauce is very easy to put together and can be prepared ahead of time. If Korean rice syrup is too difficult to locate, you can use honey or corn syrup instead. 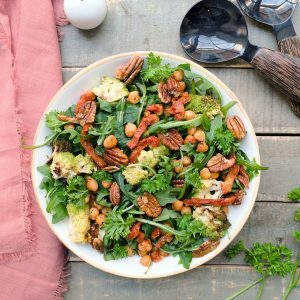 This recipe isn’t exactly like the ones from the market that I purchase, but they are equally as tasty. The sauce reminds me somewhat of a sweet and sour sauce. Korean hot pepper paste is actually sweet and only slightly spicy, which gives the sweet element to the sauce. Everyone loved this dish and requested leftovers; unfortunately, there were none! This is life-changing chicken! Thank you for sharing! I've always wanted to try making korean fried chicken. 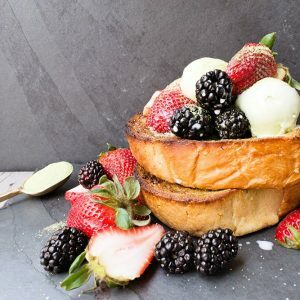 I will give this recipe a shot!